Free Shipping to the lower 48 US states, reduced shipping to Canada. Ships February and March. This special combo pairs two famous Florida tangors: Temple Oranges and Honey Tangerines. Tangors are a hybrid of Tangerines and sweet Oranges. These juiciest, most flavorful resulting fruits are among the most prized winter varieties. 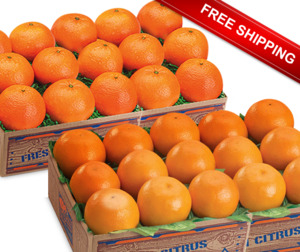 Temple Oranges have a rich color and flavor, and are suitable for fresh eating and juice. Honey Tangerines have a thin "zipper" skin that peels easily. They section readily and are named for their honey sweetness. The seasons of these two tasty tangors overlap for only a couple weeks in February/March. Order now so you don't miss out. Sign up to be notified when Temples/Honeys Ts are in season. Free Shipping to the lower 48 contiguous US states, reduced shipping to Canada. This pack is available to be shipped February and March only. This Florida Temple Orange and Honey Tangerine Free Shipping Special is available for the period of February and March when the seasons of these two winter varieties overlap.